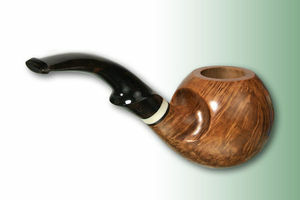 Corrado Pipe Courtesy of italianpipemakers.com Since 1983 Corrado is the holder of the homonymic graphic, design and industrial and advertising photography studio. 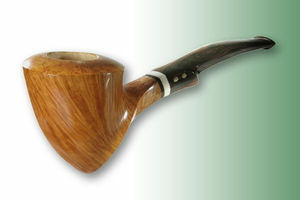 He has been smoking a pipe since the 70's; in 2004 he started to shape his first pipe from a piece of briar. Since then he has proceeded, several times, to file, drill and sand briar blocks, to become skilled with the equipment used to produce a perfect product, both in design and in finish. His pipes and mouthpieces are completely hand made, except for the bores which are made with a vertical drill press. 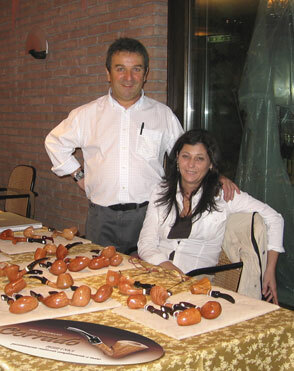 Corrado uses aged briar, with ebauchons seasoned from 3 to 10 years, carefully selected piece by piece. The mouthpiece, a fundamental part of the pipe, is designed and produced individually for each single pipe, to have it perfectly fit with the shank. They might be inlaid with several different materials, like briar, Yak bone, etc. To avoid moisture condensation and to efficiently cool the smoke, Corrado designed a removable device which can be inserted between shank and mouthpiece, but without having it permanently attached to the pipe. This special device, called "Hoof", does not change the shape of the pipe when it is removed. It is essentially a patented cooling system, made to collect the condensation with the benefit (being removable) that it does not permanently affect the design of the pipe. 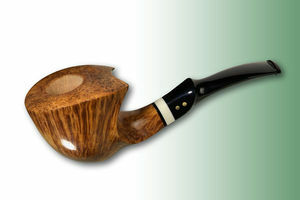 To create each briar "Hoof", Corrado must perform a Carthusian labour, to connect it to the shank and mouthpiece, while still having the shank perfectly match the mouthpiece, even without the "Hoof". This page was last edited on 11 June 2015, at 20:33.